Isn't it amazing how a quilt can tell a story? How it brings us back to a place in time or fills our hearts with memories of the one who took the time to make it? In my home, we have various quilts made by loved ones, and I love how when I'm looking at one of these or snuggled up inside I am instantly reminded of the love that went into each stitch. In my son's room, he has a Thomas the Tank Engine quilt made for him by his Great Grandma. He sleeps with this quilt every night, and I know that even long after he has outgrown this Thomas phase (should that EVER happen), it will serve as a beautiful reminder of those years when Thomas was his world. Likewise my daughter has a princess quilt made in love by that same great grandmother. Just a few of the couple quilts made by her in our home that we love and use daily. Perhaps my favorite quilt in our home though is a stunning quilt made for my husband by HIS great grandmother. He has had it for many years and the edges have started to fray...and yet it remains a favorite. I never got to meet this grandmother, but I love having this little piece of my husband's family history in our home. These quilts all tell stories of family love, but some quilts tell other stories. Maybe its made of baby clothes or the clothing of a loved one that has passed. One of the quilts that is beloved by my extended family is the very last quilt that my great grandmother made. Now, my great grandma was the ideal grandma--- she was always working on some type of quilting or crochet project and she was amazing at it. But this particular quilt shows a bittersweet story. It starts out looking much like her typical quilts- tight, perfect stitches... but as it continues on, those stitches become looser and less perfect. As her health declined, the stitches declined. While some might say that this quilt was imperfect compared to the ones that came before, I cannot help but think its beautiful. It may not be as perfect...but it serves as a beautiful, bittersweet reminder of her life and her final years, and her love throughout it all. It is those stories that make for the most beautiful quilts, not the perfect stitches. Inspired by thirty famiy heirloom quilts, each devotion depicts the enduring legacy of faith, family and tradition. 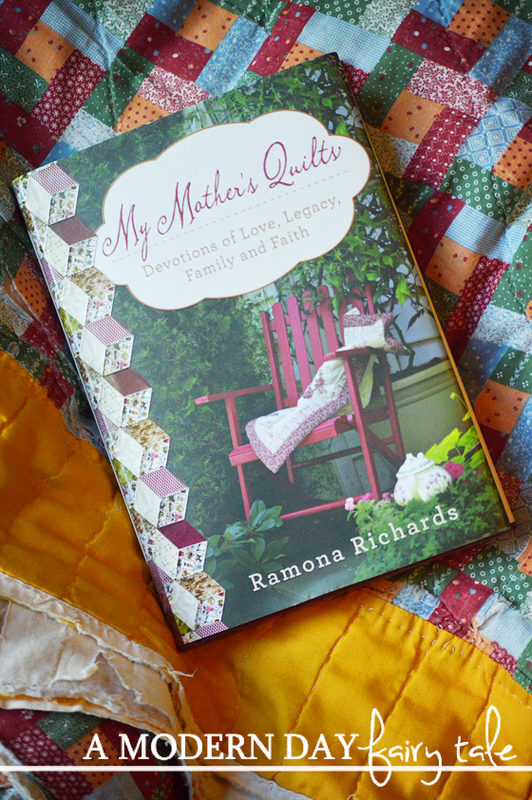 Rich, personal, sometimes heartbreaking, often funny, each reading provides a lesson and encouragement from the faithful women who crafted the quilts. Full-color photographs of each quilt show the style and artistry of each beautiful work. The quilts, sewn by several generations over more than one-hundred years, are as unique and lovely as the hands that created them. The oldest was buried during the Civil War to keep it safe and the author's mother created the newest in the last years of her life. Now, I'm not a quilter by any means. I've made one simple baby quilt for 4-H many years ago and that's about the extent of it. 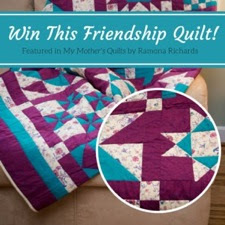 I don't know the names of various quilt styles or the first thing about creating one. I am just an admirer of their beauty and the stories behind them. This book made me fall even more in love with them. With each page I turned, I was drawn in by the beautiful photos, but more importantly the beautiful stories behind them. It is a reminder of the things in life that matter. When you pass along a quilt with such history, you're not just passing along a blanket--- you're passing down a legacy of love. A legacy of faith. A legacy of memories. 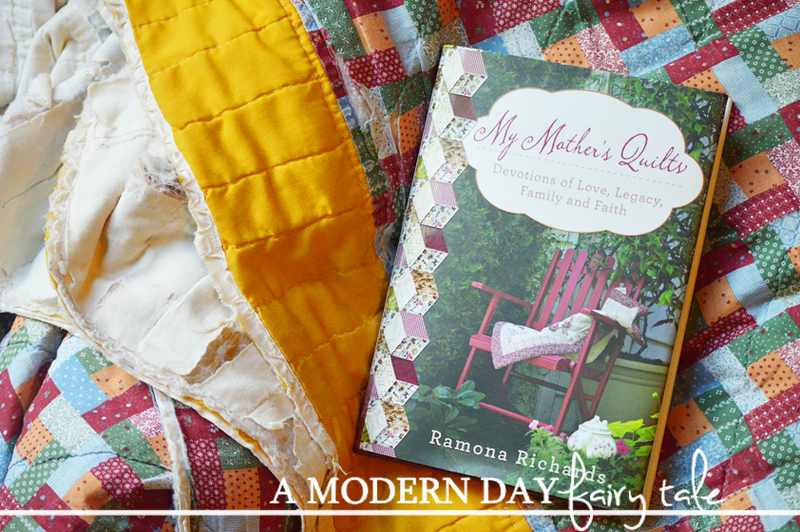 Whether you're a quilter, a collector or just looking for some touching stories of family, this book of devotions is one to read! You can purchase your copy here. I entered!! This sounds amazing and would be amazing to win!! I love quilts too, but I haven't learned to make one other than a small baby blanket once! My grandmother was a quilt maker.. I wish I had learned from her. This book sounds like a treasure.